I love to cook. Or - let me rephrase. I love to get ideas for Jake to cook. Sometimes I help. We do the whole couple in the kitchen thing. It is cute. I also love to read blogs - if you don't have a Google Reader to organize your blog reading, you need to get one. Now. I am subscribed to about 50 blogs, no lie, and could easily add more. It is great. Some of my favorites revolve around food (like my absolute favorites, Annie Eats and Pioneer Woman) and I have a routine of emailing Jake the recipes with notes like "let's make this" and "doesn't this look good"? It is my new form of shopping...shopping for recipes. - We bought Herbes de Provence because we cook a lot and like Continental food but you could easily substitute like they said. 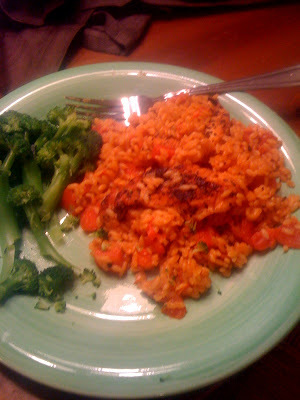 - We put our broccoli on the side but you can always put yours in the orzo if you want. Season both sides of the chicken breast halves with salt and pepper. Sprinkle evenly with the Herbes de Provence. Heat the olive oil (or spray pan with cooking spray) in a 12- or 14-inch skillet over medium-high heat. Add the chicken breast halves to the pan and cook about 3 minutes per side, until golden brown. Reduce the heat to medium, add the shallot to the pan and sauté 2-3 minutes. Add the garlic and sauté an additional minute, until fragrant. Add the diced tomatoes with juices and the broccoli florets to the pan, scraping the bottom of the pan to remove any browned bits. Bring to a boil, then reduce the heat to simmer over medium-low. Cover and let cook until the broccoli florets are crisp-tender, about 10 minutes. Remove from heat and stir in the cooked orzo, heavy cream and Parmesan cheese. Mix until well blended and the cheese has melted. If necessary, add some of the reserved pasta water to smooth out the sauce. Season to taste with salt and pepper. Serve immediately. 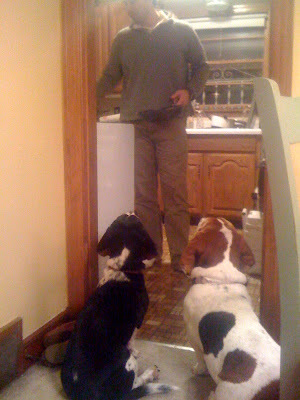 By the way - isn't this just a sweet picture of our boys watching my guy cook? i think its hilarious you said this is your new form of shopping.... beams and sebastian are precious.